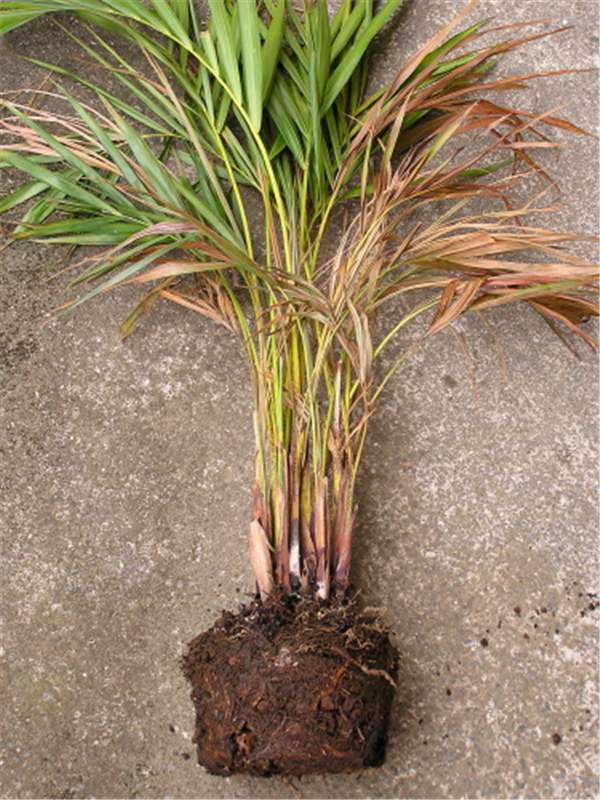 However, given the wide geographic distribution range of the pathogen, other palms may be undocumented hosts. The pathogen has a worldwide distribution. The diagnostic sign of this fungus is the large mass of pink, salmon pink or orange pink spores that form on the external surfaces of the affected palm area (Fig. 1-3). The portion of the palm affected by this opportunistic pathogen varies considerably, but is almost always associated with a wound (natural, man-made, insect), weakened host tissue due to unfavorable environmental conditions for the palm (cold, drought), or young bud tissue. 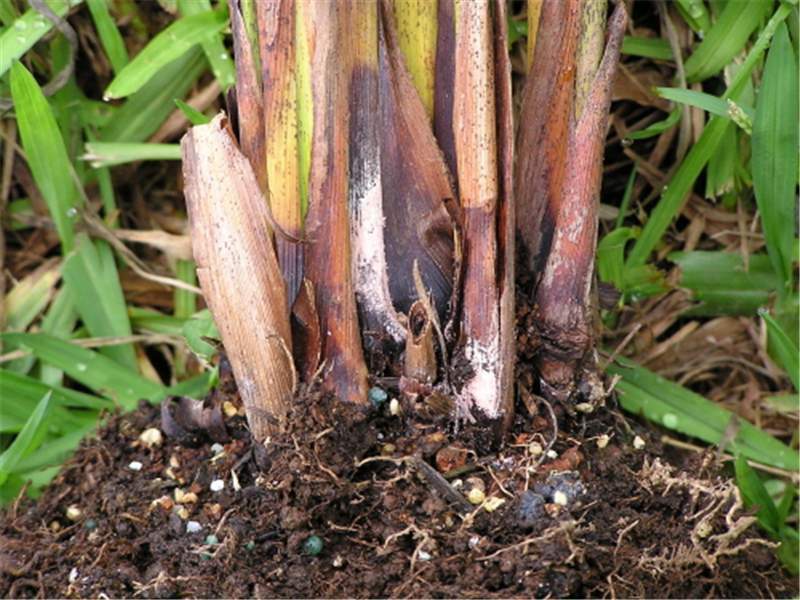 The fungus can cause serious problems in small palms, especially in greenhouse situations, where it causes leaf spots, leaf sheath (leaf base) rot (Fig. 4 and 5) and bud rot. Symptoms vary based on the disease being caused in each particular situation - e.g., typical leaf spot symptoms are associated with leaf spot disease. This fungus is also the cause of a trunk rot in Archontophoenix and Chamaedorea. A necrotic lesion (canker) with a water-soaked margin will form on the green trunk tissue, with the typical mass of colored spores forming in this canker. The disease progresses inwards until the stem fails. 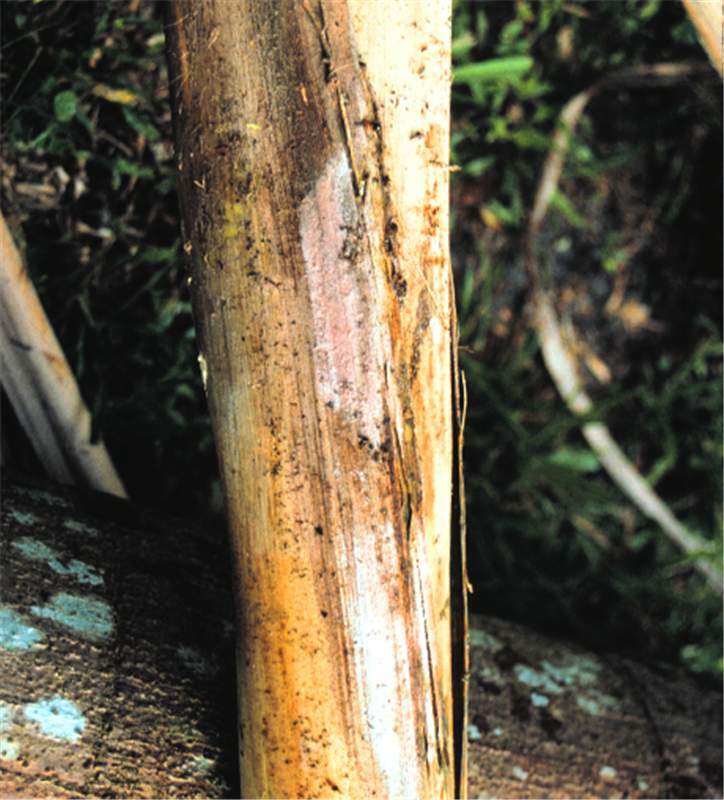 Although a trunk rot in Syagrus romanzoffiana is often attributed to this fungus, it has not been proven that this fungus is the cause of the symptoms observed, and Gliocladium spore masses are rarely observed on the trunk of this palm species. If the distinctive pink colored spore mass is not present, the symptoms on seedling and juvenile palms will appear the same as any other leaf spot, leaf sheath blight, or bud rot disease. The fungus is believed to be more prevalent or causes greater damage in cooler climates or in cooler weather periods. It does not grow above 33 degrees C. It is a ubiquitous fungus that survives equally well as a saprophyte. Figure 1. Pink spore mass of Gliocladium vermoeseni (Nalanthamala vermoeseni) on palm leaf base. Photo by T. K. Broschat. Figure 3. Pink spore mass of Gliocladium vermoeseni (Nalanthamala vermoeseni) on spear leaf. Photo by M. L. Elliott. Figure 2. Pink spore mass of Gliocladium vermoeseni (Nalanthamala vermoeseni) on inflorescence sheath. Photo by A. J. Downer, University of California. Figure 4. Leaf sheath rot of Dypsis lutescens caused by Gliocladium blight. Photo by S. Nelson, University of Hawaii at Manoa. Figure 5. Close-up of leaf sheath rot from Fig. 4 illustrating pink spore mass of Gliocladium vermoeseni (Nalanthamala vermoeseni). Photo by S. Nelson, University of Hawaii at Manoa.